July 28 is Makoto Shichida’s birthday. Makoto Shichida began working as a home tutor when he was a university student. He encountered junior high school students who couldn’t remember what they had learned five minutes earlier. This shocked him and became the stimulus to begin learning more about the human brain and education. In the process of his studies, Shichida encountered the educational theories of Karl H.G. Witte and his rule of diminishing abilities. He empathized with Witte’s theories, intuitively felt they were correct and, in 1958, opened the “Educational Institute” in Gotsu, Shimane, Japan. Shichida continued to research early childhood education and because of his personal experiences fighting illness, he had a strong awareness about health. Shichida began building the theory of Shichida Right Brain Education alongside the idea of developing children’s hearts. Twenty years later, he formed Shichida Child Educational Institute, Co., Ltd., the predecessor to what is known today as Shichida Educational Institute, Inc. Almost 60 years have passed since the Shichida Method Educational Theory was created. 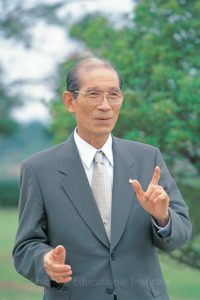 The theories that Dr. Shichida left behind are now recognized around the world and educational centers exist in 16 countries and territories. We look forward to watching Shichida Method Education continue to spread around the world.